ZEEN101Success StoriesStrategyWhat if you simply let paid subscribers post classifieds? Advertising is often the lifeblood of a magazine, financially speaking. Whether it’s a full-page photo ad with an attached perfume sample or a veritable catalog of classified ads, advertisements are a source of income. To a certain extent, this is true of web-based publications as well. Though banner ads have proven unreliable, a classified section can prove a valuable resource for publishers and readers alike. Small Boats Monthly saw the benefit of such a service. 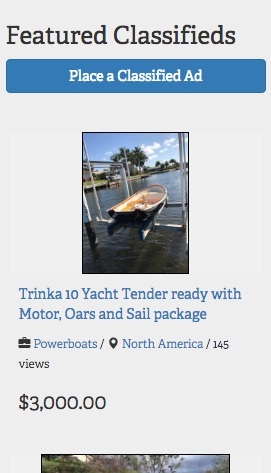 Classified ads seemed like an obvious inclusion for a web-based publication geared toward small craft aficionados – the type to collect or build their own boats, only to trade them in for a new challenge. They found it was harder than they expected. They just weren’t attracting many ads. Of course, it didn’t help that the third party plug-in they were using just would not integrate properly, no matter what they tried. The solution turned out to be simple, literally. Small Boats Monthly needed to simplify their set-up. Instead of running a separate, third party track for classified ads, they could fold the whole thing into the subscription service provided by Leaky Paywall. It’s easy, really: any paid subscriber can post an ad for no additional fee. It’s also easy to set up. With the click of a button, Small Boats Monthly (with Leaky Paywall) can restrict access to the ‘Place An Ad’ page. Every visitor to that page is now given the option to either log-in or become a subscriber. Small Boats Monthly has found a number of benefits to the new set-up. It’s easier for ad-posters to use. It’s easier for them to use. And it opens up a whole new readership for them. People who just wanted to place ads now have access to their treasure trove of content… and are added to the Small Boats email list. In one easy stroke, they’ve opened the door for a more robust classified section and more readers to enjoy and share their content. Want to learn more about how Leaky Paywall can solve your problems? Let’s chat.